A flawed but interesting take on vampires and the problems that arise from being one. Dontnod Entertainment made a name for themselves with the ever popular Life is Strange series. So for them to take a stab at making a story featuring a newly turned vampire and the tough choices he has to make was an interesting path to follow. With Focus Home Interactive in tow, they bring us Vampyr, a flawed but fascinating tale that begs to keep your fangs in it despite its faults. Taking place in a plague-ridden 1918 London, you take the role of Dr.Jonathan Reid, a blood doctor that wakes up in a mass grave and quickly learns he’s a vampire after drinking the blood of his sister not long after awakening. Filled with guilt but also the urge to feed on blood, he does his best to find a cure for the plague in London and also his own curse while keeping his thirst at bay. This proves to be quite a challenge as the urge grows stronger all the time, and throw in the fact that other vampires and monsters are on the loose, and you’ve got a powder keg that’s ready to go off unless you and Jonathan stop it first. 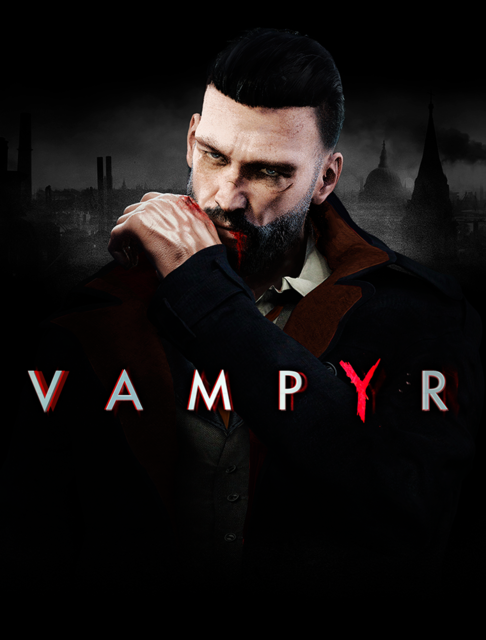 I’ve always been a sucker (pun intended of course) for vampire shows, movies, games, etc where the main character is torn between their humanity and their need to feed, so Vampyr immediately pulled me in and keep me there. With its perfectly dark and dreary look of World War I London that’s being torn apart by the Spanish flu, this helped to draw me into the world of the game even more along with the numerous dialogue trees you’ll come across when talking with others. This becomes a key part of getting through the game as it’s up to you to decide which people you’ll help get better by finding items and crafting medicine to possibly use their better blood to drink and become more powerful later on, or can let the city and its people fall into ruin. This is where tough choices come in as if you want to play the good guy, you have to do your best to help others but not feed on them. But in order to become more powerful with XP and unlocking new vampire abilities to use, you need to feed on others and kill as well. While all of those things kept me playing, it’s sad to say that this is where the fun ends and the frustrations begin. First off, the combat here is pretty bad as it lags and feel extremely cumbersome even when doing your basic combos. Also, when you learn new abilities and level up, you never feel any stronger as the enemies tend to soak up more and more of the damage you deal. You’d think for a game where you play a vampire, you should have all of the supernatural strength, powers, and fear that comes with it, but that’s sadly not the case here. While the dialogue and voice acting is pretty good on its own, the facial animations (or lack of) make the characters look like they’re bored, even when filled with emotion. To make things worse, a lot of time when you pick choices from the dialogue tree, they don’t tend to line up correctly which makes for some odd, immersion-breaking conversations such as a patient being happy with you one moment and hating you with a passion the next. Then there’s the usual suspects of graphical errors such as NPCs being stuck in walls or in the ground, the game crashing numerous times, and such that you’ll come across. While it has flaws and some to spare, Vampyr is still a game worth sinking your fangs into. With a nice amount of patching, this could easily turn out to have more bite than it does now. But as it stands at the moment, only the most dedicated vampire lovers will make it through this plague-ridden adventure.